Sincerely, Lo. : Guest Post: 7 ways to keep your vacation on a budget. 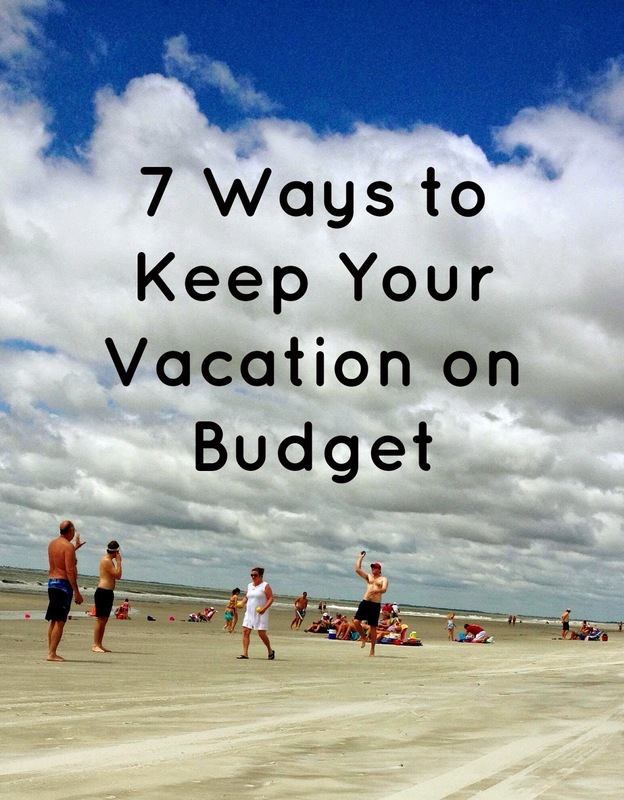 Guest Post: 7 ways to keep your vacation on a budget. Yall be sure to check out her blog and follow along! I am a Christ follower, wife to Andrew, mama to Bailey Drew, teacher… and I am pretty frugal. Lauren has been so gracious to let me stop by and share a little of my heart! So… as the name of my blog infers, I figure I should write about something budget related! 1. This may seem to go with out saying, but you need to have a budget for your vacation. Whether it is a day, weekend or week long trip, a budget is a must. When you don't have a budget you are going to look at your bank statement and say, "What! How did we spend that much?" Put in writing, or on envelopes, we will spend no more than X on food, X on shopping and so on, will keep your spending in check. 2. Take time to prepare ahead of time. How many days will you be gone? How much will you spend on gas? How many meals will you eat out? What things should you bring? A penny worth of planning can save big bucks in the long run. For example, when you go almost anywhere during the summer sunscreen is a must, but buying sunscreen at the beach or near your destination will probably be way expensive. Start looking for deals on sunscreen a few weeks out, or at least grab some before you go! 3. But don't get too prepared… I struggle with this one for sure! You can go a little crazy with the "preparations" and all of a sudden you have spent $300 at Walmart on things that you don't actually need for the trip. Case and point, last year at this time we took our two month old daughter to the beach. I got her reusable swim diapers, swim shirts, tents, sunglasses and the list goes on and on. When it came down to it, I didn't use half of it. There is not that much a two month old baby actually needs. 4. Only shop if your plan to shop. Just browsing shops, window shopping or stopping by the outlets can kill your vacation budget. There is *almost* no such thing as window shopping; you almost always buy something. We love to outlet shop (though my husband wouldn't admit to it). We either plan for it… like I said it is something we enjoy… or skip it entirely! 5. Don't eat out for every meal. First let me say that I think good food is an important part of any trip, I love to eat. But eating out every meal costs a small fortune, and you start to feel gross after a while. Even if you are staying in a place with no kitchen and no continental breakfast you can make this work. We plan which meals we are going to eat out before we go. If there is not kitchen we usually eat out one meal a day, if there is a kitchen we will just eat out a few times over the trip. We bring a cooler with fruits and veggies, stuff for sandwiches and granola bars. Also, as far as restaurants go, we try to steer clear of the super touristy places, and go for lower middle of the road places/prices. These are generally just as good if not better. 6. I recommend using a cash budget. It is harder to go over budget when you use cash and have a when it is gone, it is gone mentality. When you have thought about all the expenses on the trip, get out that money, and ONLY use that money. 7. Come with a tentative plan, but be flexible. I hope you will follow me! So hard to do this well on vacation. I always get in the "I'm on vacation" mindset and do whatever I want. Nothing ruins a great vacation like a little buyer's remorse when you get home. We always try to book a hotel with a kitchen. We do breakfasts and dinners at the hotel but will eat out for lunch (because we're usually out and about in the middle of the day anyway). Plus, I find most restaurants are more kid-friendly during the day as opposed to in the evening. We do cash in envelopes for food. Usually the hotel has breakfast so I figure out how much lunch and then dinner will be. Any left over money each day is used for snacks or a splurge toward the end of vacation. Great tips and reminders for summer travel! Vacation can easily get out of control if you eat out every meal, too. Thanks for sharing at the Saturday Soiree Blog Party! Love Stasia and her post about keeping to a budget!! Thanks for sharing on What You Wish Wednesday. You have a lovely blog. Come back tomorrow for another link-up!! Taking cash is the best bet to staying on budget along with taking as many meals as possible. Making slow cooker meals ahead of time, freezing them, and then cooking them there is the best bet! And clean up is a snap with the slow cooker liners!